One of the worst people you can encounter at a bar is someone who's trying to beat the sh*t out of you. Whether they've had a little too much to drink, or are just looking to try out some MMA moves on the next poor sap who looks at them funny because they have insecurity issues stemming from a childhood stammer, there's a high probability that, at some time in your life, a fist might be thrown towards your face if you're hanging out at a bar. Thanks to these tips from Brian Rozenblum, a 25yr martial arts vet and owner of the Elite Krav Maga studio in Denver, now you can learn the basics of how you'd fight back. To actually fight back, you have to practice this in the real world, preferably in a martial arts studio, and not by repeatedly throwing trash cans at guys in River City Ransom. In the meantime, study up. That's pretty Zen, right? But seriously, when you walk into a bar, learn your surroundings. Figuring out where the exits are could help you escape quickly to avoid conflict. And weird exes. Before you start droppin' bows on 'em (because that's what you do, right?!? ), try a "soft technique" that won't require breaking some dude's face. If he swears up and down you done him wrong, try to defuse the situation by buying him a drink. If he grabs your wrist, you can do a simple wrist release. 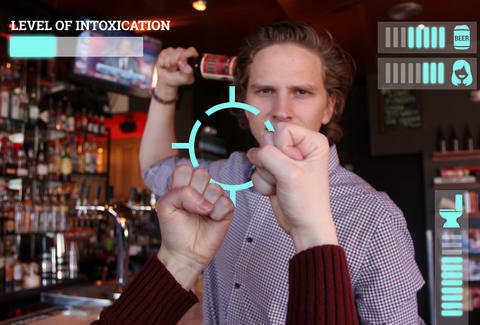 Don't be afraid to use "weapons of opportunity" you see around the bar. The one rule of Krav Maga is that you don't talk about Krav Maga get home safe, so you do whatever you have to in order to make it a reality. Whether that's grabbing a bar stool, a cue ball, or a beer bottle, it's really whatever's close by and works best for your abilities. Former pitchers might wanna look out for that cue ball. While former spelling bee champions should look f--RUNNN!! If the bouncer mistakenly identifies you as the aggressor even though you're the one being attacked and actually only passive aggressive around your stepmom, he might take action and put you in a rear naked chokehold. They're difficult to get out of (but it can be done! Start at 1:44.) -- typically, you only have seven seconds to escape before you go night night. The key is being aware of your surroundings and not letting it happen in the first place. The bad news is that if someone wants to shoot you at close range, they'll shoot you. Regardless, the standard technique for having a gun pointed at you is to redirect the gun, control it, attack the assailant, and disarm. If you're at the other end of the bar, run. It's harder to hit a moving target than you'd think. Defending and attacking at the same time is a bedrock principle of Krav Maga, and when you're faced with a knife, you'll want to adhere to doing just that. Victims will often defend without attacking, which leaves them with defensive wounds on their arms and hands. The 360 Defense, which "creates a barrier against their strike", will allow you to wrap their arm and throw counterattacks. It also has the added benefit of sounding like a way to defend against 1998 Vince Carter dunks. If a group of dudes comes at you, the conventional wisdom states that you go after the bigger guy, but Rozenblum says that's not necessarily a good idea. He recommends disarming "the closest guy you can get your hands on". And then you can use that dude as a shield, Captain America-style. When you're put into highly stressful situations like a fight, your body tends to freeze up. Learning all the techniques in the world isn't going to help if you can't put them into action. That's why performing in stress drills is critical to getting out alive. Find a center near you and start training. Lee Breslouer writes about food and drink for Thrillist, and doesn't believe the ice cream headache is a real thing that can happen to someone. Follow him @LeeBreslouer, because you can't make a name that good up.